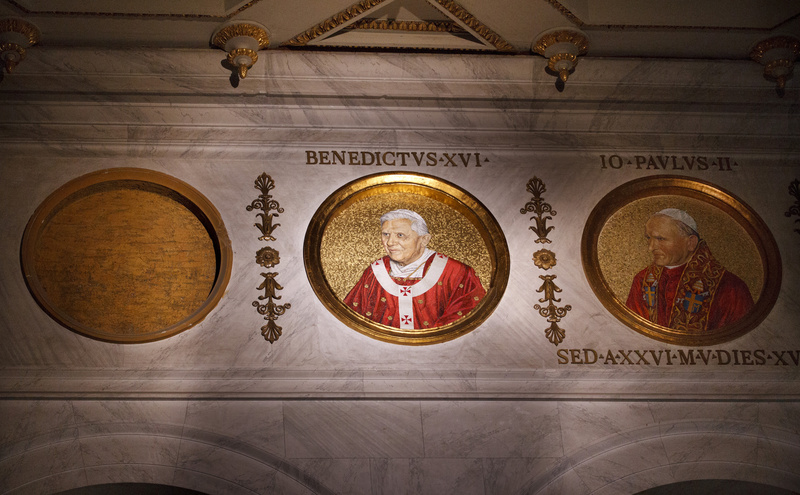 When Pope Benedict XVI was removed from the summit of the visible Church, what lay beneath him was revealed. I use the passive in this instance not in order to provoke controversy regarding his 'removal' in the sense of a conspiracy that achieved it, but rather to place Benedict XVI's pontificate in its proper place, within history. After all, history sees everyone removed from every position of status in the end and the same will happen, eventually, to Benedict's Successor(s). Every priest, every Pope is in the soul eternal. Every priest, every Pope, though, is in the body transient. Since Benedict XVI's departure into a new role of prayer within the Church, while 'remaining in the enclosure of St Peter', what has created a terrifying tempest within the Church and - in as much as it cares - the World, has really been the difficult digestion of difficult truths. Whatever you think of Francis and his 'effect', the deeply insightful interview with Pope Emeritus Benedict covered here by Life Site News and here by Fr Z positively glows with a clarity of thought that so many miss in the Church today. One Peter Five also covers the news of the sweeping interview. Since his abdication, the Pope Emeritus has been a man of few words, so those words which he does speak are - in contrast to the abundance of words produced by his Successor - all the more interesting. In this sense, less becomes more. Truth and opinion becomes concentrated, crystalized. True to his previous form in his intellectual and spiritual combat against the relativism of our times, again Benedict's battle is against ideas, not against the people who hold them. They can glean from it what they want. So it is, then, that the Cardinal, Joseph Ratzinger and the Pope, Benedict XVI and the Pope Emeritus, Benedict, is able to hold court in tackling ideas to the ground, but leaving the people who hold them in place, even while figures such as Cardinal Kasper, who have long since outed themselves as theological oppponents of all that Benedict XVI stood for, declare victory with gladitorial glee over Benedict's 'outmoded' concept of Faith. So because of the wait for his opinion on the state of the Church today, what Benedict has said is all the more pointed. It is made even more so, because Benedict is talking about things that Pope Francis and Cardinal Kasper had relegated as non-issues. Baptism as necessary for Salvation? The possibility of Hell and separation from God eternally? The breakdown of Catholic culture and identity? The collapse of the Church's mission? These are different issues to climate change, poverty and structural economic injustice. We see, in just one interview, the striking contrast between the Church obsessed with the secular and the Church obsessed with Faith, with Divine truths, with the sacred, with holiness, with a relationship with Christ. For this reason, I do hope Benedict gives another interview soon. It's like hearing from your Dad after a long time of no communication at all. Of course, Cardinal Kasper - and all those who have promoted his truncated, frankly man-made, counterfeit vision of the Gospel - are unable to declare a victory that is in any sense coherent, or intellectual, or even moral. This is victory for victory's sake. When Cardinal Kasper says that the Apostolic Exhortation of Pope Francis will turn a page over 1,700 years of Catholic history, we can be sure that this is not evidence of the vindication of his intellectual position in his tussle with Joseph Ratzinger and Benedict XVI, but rather a groundless assertion of might over right, an indication of what can happen when the Church, imitating the levers of the State, becomes not a lover or sanctifier of mankind, but 'a band of robbers'. And it is interesting that Cardinal Kasper cannot talk so contemptuously of the Catholic past, in the Catholic present, without looking towards the Catholic future. But what is it? As Fr Ray Blake asks, what is that future? Where does the Church have a future? Benedict XVI was and is able to see that there is, in fact, no Catholic future unless the Church rediscovers Herself and her Lord in seeking His Face, in accepting the fullness of divine revelation, of coming to terms with Her traditions, teachings, beliefs, customs and her ancient Rites in loving what has been entrusted to us and passed down to us by previous generations. Cardinal Kasper's theology which wafts that acrid 1970s scent that the presence of Benedict XVI at the helm of the Church had for so long masked so effectively (but which now no sweet fragrance can cover), disregards the future of the Church being in any sense 'Catholic' or even exclusively 'Christian'. This is not even an 'evolution of dogma', but nor really 'a new page'. This is not simply even a blank sheet. This is a new book entirely. Divorced from Christ, separated from her roots, remarried to the World, the State and the age, the Church of the future could write a new story concerning man, God and man's place in the drama of Redemption. It can write new rules, new customs, a new theology, a new Mass even. Nothing previously received has to inform the new story. Benedict XVI must have known and still knows that such could happen and such might very well happen. All he did, all he said, all he is saying now is that the Church could indeed - and very well might - do that. What concerns Benedict XVI, but does not concern Cardinal Kasper and almost certainly not Pope Francis is this question: Would that be a true story? Would that be a faithful story? What is the cost to this abandonment of the authentic Christian message? Did Jesus Christ really give the Church the authority to write a new story that was different to the real one? Most readers of this blog, I and the Pope Emeritus can answer to that question a definitive 'No', so those already calling Benedict XVI out as a modernist, I would say, need to take a step back and recognise - at least - the gulf in the concerns between the present Vicar of Christ and the 'ex-Vicar of Christ' who lives down the road, for it appears to be a gulf similar to that between Lazarus and Dives. Ultimately a new faith, not a 'continuation', not a development of dogma' is where the deep, two-sided crisis of faith leads. It is there hidden, in plain sight, between the lines of Cardinal Kasper's 'prep-work'. Pray for the Pope Emeritus. He clearly isn't going to simply watch the foundations of the Church be destroyed without saying anything at all. The wolves he warned us about are sensitive creatures, not wishing even the precise nature of the errors that they promote to have light and clear thought penetrate their being. That is the nature of the dictatorship of relativism. It seeks to use authority to stamp upon Truth rather than serve it and proclaim it. Pope Francis will be held accountable to God - as all bishops shall be - for his governance of the Church entrusted to him, but the servant of the servants is also accountable to the flock of Christ. It may well be that he needs to be reminded by 'the little ones' that a lie does not become the truth by telling the lie and passing it off as truth, merely by virtue of the power and the authority wielded in the process. Remember that Benedict XVI rarely, if ever, as Pope imposed from above, in a dictatorial manner, the truths which he guarded, defended and proclaimed, and, far from exiling figures such as Cardinal Kasper and those he knew to hold views that Catholics in previous times would regard as dangerous, held his brethren in great esteem and truly respected, if not their opinions, then their persons. Benedict's style is now and always was to convince and persuade appealing to reason and to counsel gently those who needed clear instruction. Now that the reigns of Church governance are in the hands of his opponents, much power has been entrusted into their hands. The wise will deal mercifully, kindly and even gently, even with their ideological opponents, but those who are less schooled in the love of truth, virtue and meekness, are more prone to act rashly, exercising power, but without a sense responsibility. Pray therefore, too, for those also. Whatever Saturday - the Feast of St Joseph - and beyond brings, pray to the Patron of the Church for unity in Christ. Thank you for your well-written article and for stating in it the implicit different between the true Catholic Faith, given by Christ to the Apostles, and the counterfeit version promulgated by the pope's theologian, Kaspar. Prayer is the only avenue open now. Let us pray for our Church and all priests espeicially. I truly appreciate your serene and thoughtful comments. I hope that calling them serene has not brought up past thoughts of what Francis called Cardinal Kasper's writings. I came upon this site by a happy accident. Thank you! I greatly miss Pope Benedict XVl. Some ask why? And I answer that when Pope Benedict XVl spoke, he spoke of God and his Truth. He gave us hope, God was being restored back into the Church. The great error that man has become the Church and that the Church has become man makes the Church seem useless. My hope continues, that God be the main reason for the existence of the Holy Roman Catholic Church. But for now we must carry the heavy Cross of the betrayal of Christ by many of our leaders and by many Catholics. I preface my reply by stating the obvious. These are my own thoughts and sentiments, though I pray God they are fruits of the grace of discernment. "Dearly beloved, believe not every spirit, but try the spirits if they be of God: because many false prophets are gone out into the world. By this is the spirit of God known. Every spirit which confesseth that Jesus Christ is come in the flesh, is of God: And every spirit that dissolveth Jesus, is not of God: and this is Antichrist, of whom you have heard that he cometh, and he is now already in the world." They say the Evil One apes Christ. It seems to me that for the past three years the relentless agenda from Domus Sanctae Marthae has been to make all one in error and indifferentism, thus aping Jesus prayer to the Father that all be one in the Truth. "Why, after three years of silence, is Pope Benedict speaking out NOW? Could it have anything to do with the fact that Pope Bergoglio will be issuing, perhaps as early as tomorrow (March 19, the Feats of Saint Joseph) his long awaited Exhortation on the Synod on the Family? (It is reported that Cdl. Kasper is delighted with it, saying that the changes laid out in the document should have been implemented centuries ago.)" "Let's see if I can make this plainer. The Pope Emeritus was not -- absolutely not -- "speaking out NOW." He was participating by invitation in a Jesuit conference last October, which had nothing to do with breaking news, before, during, or after. Do not attribute to the man a motive he would unambiguously deny. The alternative is to suppose that Ratzinger is some sleaze, playing the factional politician in retirement." It seems to me that this lecture by Pope Benedict was released by other persons to try and 'balance' what might come out the official document on the Synod that Pope Francis will release tomorrow. I admit, I am very worried about that, as I tend to agree with Liam Ronan's comment. Big mistake for him to resign. Pope Francis is a disaster. Maybe he should have set them farther apart. But it may not have helped because VERY old 'progressives' (to be charitable) have been called up so even if they had been quieted, they would have been given power now to subvert things. Yes, the Pope, Cardinals, Bishops, Priests, and Deacons have a SPECIAL mandate to guard, defend and proclaim the TRUTH. It is a responsibility before God. We all must adhere to the Truths of the Church but to some it is of greater responsibility. Still missing this great Pope..... Thanks Mr. Bones for this post, God bless you, Pope Benedict and all of us. The poison slowly works its way, or grace gently or abruptly comes as an antidote - if we will. Fr Ratzinger was a VII 'expert'; 'Benedict XVI', lauder of Lutheranism, public unrepentant promulgator of the Assisi scandals, supporter of the lie of Wojtyla 'sainthood', and 'convincing' come-hither for confused would-be Catholics - www.traditioninaction.org/religious/m028rpNeocats.html - did not change his spots on indifferentism, universalism, 'rationalism'. Ratzinger is the antipope who disposed of limbo - a medieval fantasy not fit for 'modern men', along with the truth of Catholic ecclesiology. The faith teaches that the Chair of St Peter can and will be vacant (the death of a pope the usual reason). The faith refuses the position that the Chair of Peter promulgates public/universal error. The 'problem' is not Bergoglio. For those who ask, seek and knock, Bergoglio is but another wake-up for Catholics to throw off the VII New Order deception. The invitation to the New Order Fr Ratzinger offered to Anglicans was like protestant chess board offering to turn itself 180 degrees. A new mass? Yes, Francis will do so, and that will be the abomination of desolation mentioned in Daniel. A new book? Yes, the one world pagan religion.